The Brookings Police Department remains committed to the Law Enforcement Torch Run and Special Olympics. Each year officers raise money and awareness for Special Olympics through polar plunges, fire truck pulls and T-shirt sales. Of course the torch run would not be complete without the actual “torch run" itself. To the right, Patrol Officer Justina Diamond gives high fives to students along the torch run. 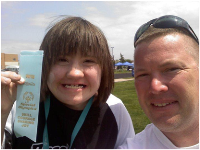 At the summer games, Sergeant Joel Perry congratulates a local athlete on her accomplishment. The Brookings Police Department has been a part of the Law Enforcement Torch Run since 1988. For additional information, contact the Brookings Police Department at (605) 692-2113.